KNOXVILLE - Johnson Architecture recently hired University of Tennessee graduate Jeremiah Corbett as an intern architect. 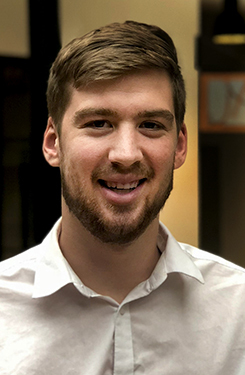 Jeremiah Corbett, Johnson Architecture Inc.
Corbett graduated in May with a Bachelor of Architecture from the UT College of Architecture and Design. In 2017 he studied abroad at Krakow University of Technology in Krakow, Poland, where he focused on environmentally and socially responsible approaches to architecture, including Leadership in Energy and Environmental Design (LEED). His college accolades included recognition for a proposed rendering of a new Tennessee Valley Authority tower in downtown Knoxville created as part of the Governor’s Chairs program, a research partnership with UT and Oak Ridge National Laboratory. Corbett also worked as a graphic designer at The Daily Beacon, the UT campus newspaper. Corbett is affiliated with American Institute of Architects (AIA) and is a LEED Green Associate. A native of Thompson’s Station, Tennessee, Corbett lives in Knoxville. In his spare time, he enjoys playing basketball, taking his two corgi puppies to the park and traveling to experience new cultures.